How to File a Workers’ Comp Claim | Johnson & Gilbert, P. A. If you're injured in an accident at your workplace in Florida, you should be entitled to workers’ compensation benefits. 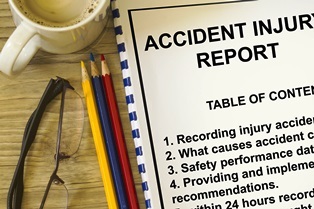 Florida has a no-fault system that gives injured employees the right to workers’ compensation benefits as long as the accident occurred in the normal course of their jobs. have to fight with your employer’s insurance company to receive what you deserve. It's crucial to understand the steps you need to take to properly file your claim and strengthen your case for benefits. Acquiring workers’ comp has become more difficult and complicated than it should be. So it's important to follow Florida regulations regarding filing a claim, and do what you can to avoid disputes over your right to workers’ comp benefits. Report your injury. Under Florida law, you're required to report your injury to your employer within 30 days of your knowledge of an accident or injury; or within 30 days of a doctor diagnosing you with a work-related injury. Once you do this, the company is legally obligated to file the incident with its insurance company within seven days. Seek medical attention. Your examination must happen with a physician approved by your employer or their insurance company. This medical professional has a responsibility to ensure you get the necessary medical attention. Make sure you fully describe your injury and follow treatment instructions. You may also want to keep a detailed journal of your injury and symptoms. Complete proper paperwork. Fill out a First Report of Injury or Illness Form with your supervisor. This is forwarded to the Bureau of Personnel. Review it for accuracy, and keep a copy of it and any other documents for your records. Make no official statements. You should avoid giving any official statements to your employer or their insurance company without first talking to an experienced Florida workers’ comp attorney. These entities want to reduce the payout as much as possible, and while injured, you could say or do something that inadvertently hurts your claim. Seek legal advice. An attorney with the expertise to handle workers’ compensation cases will guide you through the complex process of filing a claim and help you obtain rightful benefits. He can also negotiate your settlement with your employer’s insurance company. You'll likely have a lot of questions if you're injured at work. Find the answers by ordering a copy of our free book, It’s Not Rocket Science, It’s Workers' Comp. At Johnson & Gilbert, P.A., our experienced Florida workers’ compensation attorneys have helped hundreds of work-related accident victims get the compensation they deserve. We can assist you with filing your claim; collecting necessary evidence to prove your right to benefits; and if eligible, negotiate a proper settlement for benefits. Get started by contacting our office today and scheduling a free consultation. My Employer Offered to Pay My Injury Medical Bills: Now What?